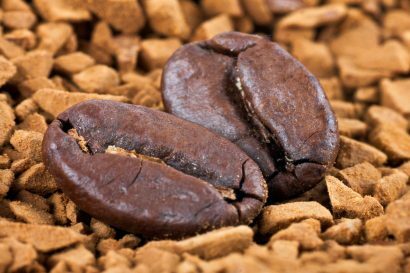 Quirky Coffee Company / Coffee Beans / What are Arabica Coffee Beans? Let’s just start this post off on the right foot by saying that Arabica coffee beans are by far the best type of coffee beans that you can buy. Why is that? Read on coffee lovers and you will find out why this is the case. The two main coffee species that are drank all over the world are Coffea Arabica and Coffea Canephora (Robusta). Arabica is divided into two varieties, Typica and Bourbon. The latter, Coffea Canephora is known as Robusta. Arabica coffee beans are far superior to that of Robusta and this is very apparent in the taste, which is smoother and less acidic than that of its relative. Arabica brings the highest prices. The better Arabicas are high grown coffees, this is generally between 2,000 and 6,000 feet (610 to 1830 metres) above sea level. However, optimal altitude varies with proximity to the equator. All of the coffee that we offer in our shop is 100% Arabica. All of the world’s highly graded coffee & beans given speciality status are of the Arabica species. Not all Arabica however is Speciality, more commercial-grade coffee will not be as satisfying to drink as that of 100% Arabica beans that have been awarded SCA grading of over 80. This denotes Speciality, coffee in its most delicious form. Furthermore, an Arabica coffee bean can not only be gifted with the title of Speciality but also be prized with a Cup of Excellence such as our Nicaraguan La Bastilla and Nicaraguan La Bastilla P3. 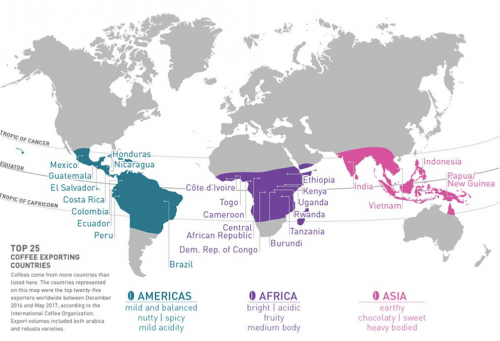 Where did the Arabica Coffee Bean journey start and where does it grow? It was the Arabica coffee cherry in Ethiopia that started off the whole coffee story, and it still grows best on high altitude ground. The Arabica shrub can grow up to 5 metres but usually kept at around 2 metres to be more commercially farmed. Arabica is believed to be the first species of coffee to be cultivated, with its origin dating back to 1,000 BC – you could say it is the Adam & Eve of coffee! According to the ICO (International Coffee Organisation), more than 60% of the world coffee production comes from Arabica cultivars. Arabica is grown in dozens of countries, between the Tropic of Capricorn and the Tropic of Cancer. This is known as the Bean Belt. Currently, 129 species of Coffea have been identified, mostly through the work of Kew Gardens in London – this number will always be growing. We mentioned that there are two types of Arabica coffee bean, Typica and Bourbon. Typica is considered the first variety of the species to be discovered. It is a low-yielding variety that is enjoyed across the world for its excellent cup quality. There are many varieties of Typica that have mutated. The Dutch were the first to spread coffee around the world for commercial production and this was the variety they took with them. Typica is still grown extensively in many parts of the world and as a result of this Typica is known by various names including Sumatra and Arabigo. Our Organic Sumatra Mandheling is an example of this. Bourbon varieties are awarded for their more complex, balanced aromas and have developed into many high-quality sub-types. There are a number of Bourbon varieties that have propagated to suit the regional climate, which only flourishes at high altitude. The Bourbon variety was a natural mutation of Typica, which occurred on the Island of Réunion (historically called Bourbon). It has a distinctive sweetness making it very popular amongst coffee lovers. Another mutation of Typica is that of Maragogype, first discovered in Brazil which has unusually large beans and larger leaves on the tree compared to that of its counterparts. Maragogype is often referred to as ‘Elephant Bean’. You can read more about our Nicaraguan Maragogype here. Could this possibly mean that a cup of coffee counts as one of our 5 A Day! We have spoken to so many people that did not realise that a coffee bean starts its life as a fruit. The coffee bean is actually a seed inside of that fruit. This visually pleasing fruit is called a coffee cherry. You would look at a coffee cherry and think you would want to bake it in a tart rather than brew as a delicious hot beverage, or a cold brew of course. You could liken the coffee cherry to a cup of coffee as a grape is to a glass of wine. So many different types to try before you find ‘the one’ that you just can’t stop drinking! 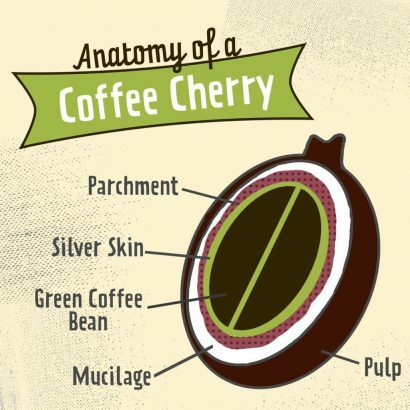 Green Bean/Seed or Endosperm – The raw Arabica coffee bean/seed sits comfortably inside of the red cherry until it is ready to fly the nest. This is when it then processed to become the perfectly roasted bean that we love. Silver Skin or Spermoderm – This protects our precious little gems. Parchment or Endocarp – This is another level of protection for the coffee bean. It surrounds the beans and has 3-7 layers. Mucilage or Mesocarp – This is the flesh of the coffee fruit. Whilst the cherry is maturing this layer becomes wealthy of sugars. Outer Skin – Epicarp – This is the outer skin of the cherry, changing from one perfect colour to another. Green, yellow, orange and then finally the bright ripe red! 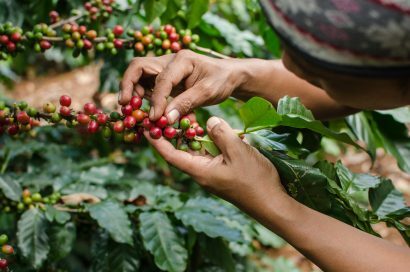 Arabica has two sets of chromosomes, so it is capable of self-pollination and genetic mutation, which means Arabica and all its forms are fairly stable. As this is such a clever little cherry, new varieties are continually being discovered. If you are unsure which to try as you are new to the coffee world then please feel free to contact us. We are always happy to talk about coffee and advise on which to try. Someone recently said to us that they didn’t like coffee! We said, “that’s because you haven’t tried a great coffee”. Just like a fine wine, one wine does not fit all, you have to try many before you find the one that really hits the spot! Another clever fact about Arabica is that of the Peaberry. Unlike all other coffee cherries that are home to two seeds, the Peaberry only has one. This is a mutation, resulting in the Peaberry which is known for its unique sweetness. You may like to try out Kenya Peaberry that packs your cup full of sweet flavours. 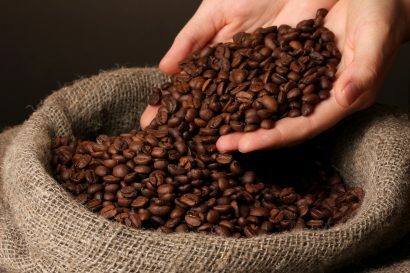 There are several legends about the first use of Arabica coffee beans. One legend suggests the goat herder, Kaldi, was the one who discovered coffee. He found that after eating the cherries from a certain tree – the Arabica tree, he became energised. As legend has it Kaldi shared his discovery with the Abbot of the local monastery and wanting to prove his theory they made a drink out of the cherries. The effect of this was that not only were they more energetic but, they did not want to sleep! Does this sound familiar? Word of course spreads fast until it reached the Arabian Peninsula, and this is where coffee as a beverage flourished. One of the major benefits of Arabica coffee is that it contains antioxidants like Vitamin E which helps to reduce the risk of infections and diseases. In addition, it contains some B vitamins, magnesium and potassium. 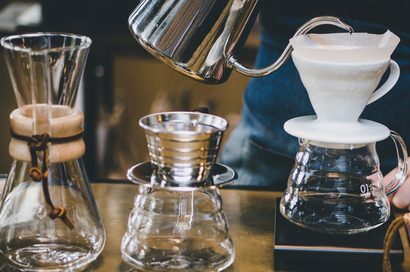 Recent research published in the Annals of Internal Medicine suggests that having three cups of coffee per day could lengthen lifespan by lowering the risk of death from several key conditions including heart disease. The study followed over 500,000 people from 10 European countries for 16 years. Of course, there are always critics, and to this end it is suggested that the study could not take into account circumstances such as economy, social and lifestyle factors. There are further studies that can be found that suggest that Arabica coffee may lower the risk of developing type 2 diabetes, prevent dementia and Alzheimer’s disease. However, the findings have been inconsistent and larger studies need to be undertaken. The Arabia coffee bean is the finest type of coffee that money can buy, some you will like, some you will love and Quirky Coffee Co sets out to provide you with the ones that you will love! Please visit our online Arabica shop where you can read, select and purchase 100% Arabica speciality coffee.